skin. That’s what you get with the Georgette Klinger skincare line. It draws from traditional European remedies, such as fruits and herbs. “All Georgette Klinger products are crafted with this singular goal in mind: to reveal your skin’s inner glow with a holistic, practical regimen.”The line is paraben-free, dye-free, and cruelty-free. I love all their masks and the Grapefruit Cleansing Gel is a must try. Head over to their website to see more of the line and learn about the amazing woman who started it all. So keep your skincare clean with Georgette Klinger, and feel free to let other things get dirty…. with modern results. That’s the promise from Grand Central Beauty. Their S.M.A.R.T. skin perfecting products are innovative and effective. 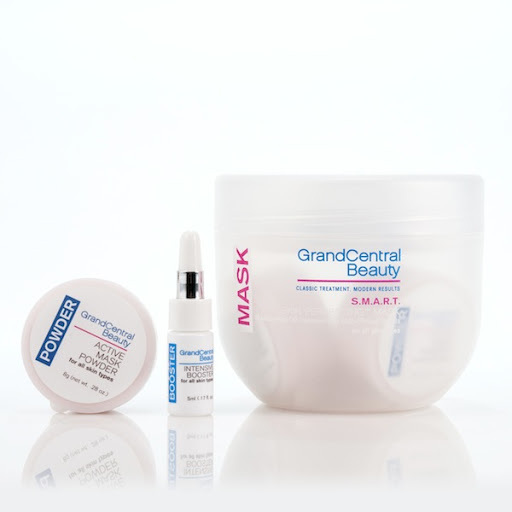 S.M.A.R.T = smoothing, moisturizing, anti-aging, redness-reducing, toning. The S.M.A.R.T. Skin Perfecting Mask draws out impurities and blackheads, brightens skin, reduces the appearance of fine lines and wrinkles, lightens up dark under eye circles, evens out skin, reduces oily spots, and provides a clear complection. It takes only 15 minutes and feels like a spa treatment. The coolest part is how it peels off your face in one piece 🙂 The S.M.A.R.T. Skin Perfecting Polisher can be used alone, or with the mask. It is a 30 second exfoliating & toning peel. It is made with natural fruits, botanicals, and polishing beads. It hydrates the skin and gently unclogs pores and dead skin cells. Your skin is left invigorated. So don’t be stupid, get with the SMART system….